Apply demi-permanent hair color for longer lasting color than semi-permanent color. Demi-permanent hair color does not damage hair as badly as permanent color due to the lack of ammonia, but it does contain some peroxide. When properly applied, demi-permanent hair color lasts between 12 and 24 washings. It is mainly used to cover greys or to darken hair. Demi-permanent hair color does not work well for lightening hair but can be used to brighten existing hair color between permanent colorings. Dry your hair. Do not apply any type of product, such as hair spray or gel, to your hair after drying. Apply a light application of petroleum jelly around the hairline and ears to prevent staining. Put on the latex gloves. This prevents staining on the hands or fingernails. Use the applicator provided with the hair color to apply to hair. Apply evenly to the desired area. Comb the color through the hair, if the applicator does not have a comb attached. Allow to set for approximately 15 minutes. Times vary based on brand. Rinse hair completely with cool or warm water. Use a light amount of shampoo to remove any scalp stains. 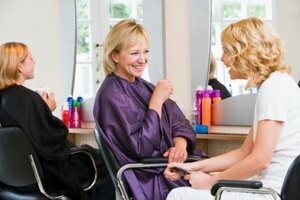 Demi-permanent hair color kits can be purchased at salons and online and offline retailers, such as drug stores. Each brand of demi-permanent hair color has a different applicator, requires a different amount of time to process and may require hot water instead of cold to rinse out. Read the directions carefully before applying the hair color. Do not place demi-permanent hair color on fabrics or skin as the dye does stain.